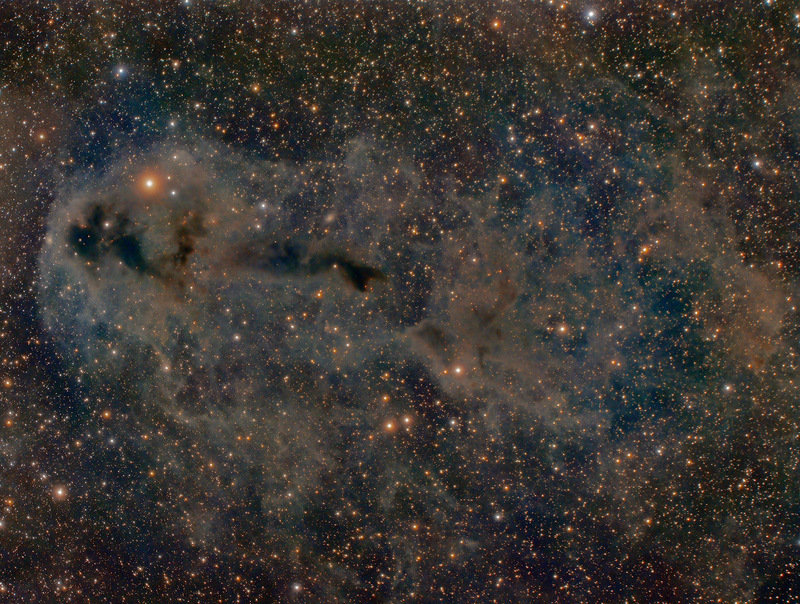 Explanation: Stars are forming in Lynds Dark Nebula (LDN) 1251. About 1,000 light-years away, the dusty molecular cloud is part of a complex of dark nebulae mapped toward the Cepheus flare region, drifting above the plane of our Milky Way galaxy. Across the spectrum, astronomical explorations of the obscuring interstellar clouds reveal energetic shocks and outflows associated with newborn stars, including the telltale reddish glow from scattered Herbig-Haro objects seen in this sharp image. Distant background galaxies also lurk on the scene, visually buried behind the dusty expanse. The deep telescopic field of view spans about two full moons on the sky, or 17 light-years at the estimated distance of LDN 1251.